Uber is testing a new feature that will help those who value saving money over saving time. The ride-hailing company’s new feature tells customers that if they wait a few minutes, they can get a cheaper price. Uber employees in San Francisco and Los Angeles are currently testing the feature. One of the employees, Gregory Jacobs, tweeted a photo of the new feature but has since deleted it. However, users can still access the photo in an archive. The photo shows that an employee was able to request their ride immediately for $10.18 USD. He could also wait and request the ride four minutes later for $8.15 — about 25 percent less. The feature could be a great addition to the service, especially for users looking to save money. Uber had a similar feature before, but it worked in the inverse. 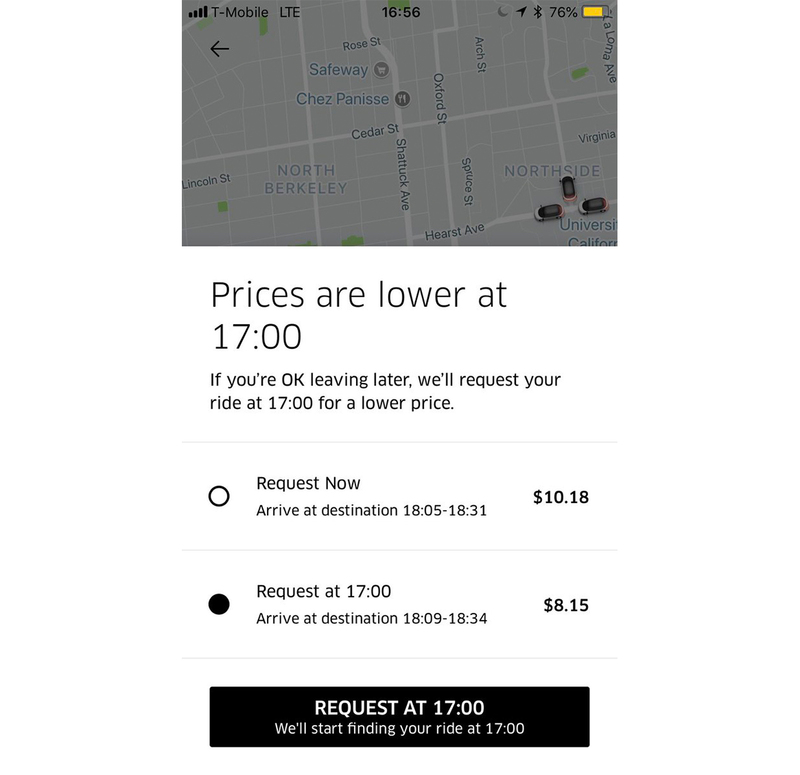 Uber uses a dynamic pricing system that increases rates when demand for rides is high. The company used to flag these ‘surges’ in price but in 2016 removed the feature. Instead, Uber now uses an up-front pricing system. The ride-hailing service quotes an estimated cost to the customer. However it often pays drivers a different amount. The service pays drivers based on time and distance driven. Due to that difference, the company sometimes has to absorb the cost if it estimates a lower charge for customers than what it has to pay the driver. More often the company comes out on top, overcharging customers and keeping the difference once the driver is paid. Screenshot of the tested feature from Uber employee Gregory Jacobs. Uber has received flak for its dynamic pricing service however. While there’s a logic to increasing prices when demand is high, Uber’s reasoning isn’t so logical. The ride-hailing company argues that higher prices will increase the supply of drivers — more money to earn, more people want to drive. However, supply and demand don’t necessarily work that way and has lead to some monstrous ‘surge pricing’ in certain instances. One such example was a surge as high as nine times the normal rate during a snowstorm in New York City in December 2013. Users saw these soaring prices because demand far outstripped the supply of drivers. Driver’s can see when surge pricing in effect. However there’s no clear data indicating whether a driver who wouldn’t drive during a snowstorm for four times surge pricing would venture out if the surge increased to six times. Regardless, the ability to request rides later for a reduced fee is a boon to customers — and a better way to manage supply and demand. For Uber, urging customers to request rides later allows the company to shift demand away from prime times. For customers with some patience, it means extra pennies in their pocket.